This architectural masterpiece of the 16th and 17th centuries is inscribed on UNESCO’s World Heritage List. 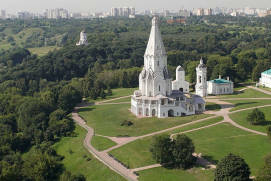 The fortress-like monastery used to be a key outpost in the southwest side of Moscow. 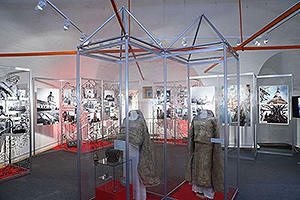 Novodevichy monastery has always been actively involved in Russia’s political life. 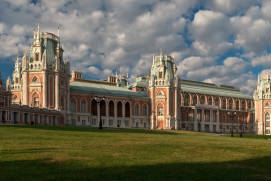 It was the residence of Irina Godunova, a Tsaritsa of Russia, and later, of Sophia Alekseyevna of Russia. The monastery is open to visitors. 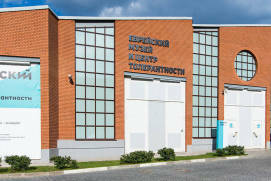 It offers guided tours and has a small museum (in Russian only). 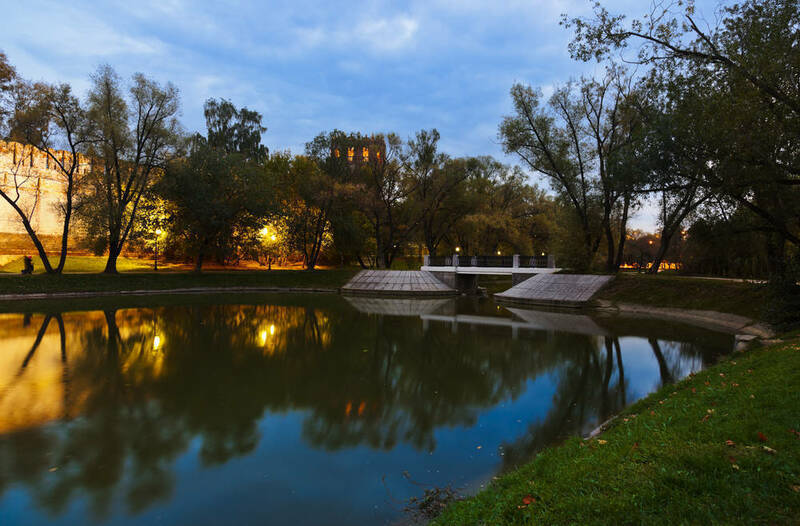 The scenic pond near the monastery is a wonderful place for strolling both in summer and in winter. 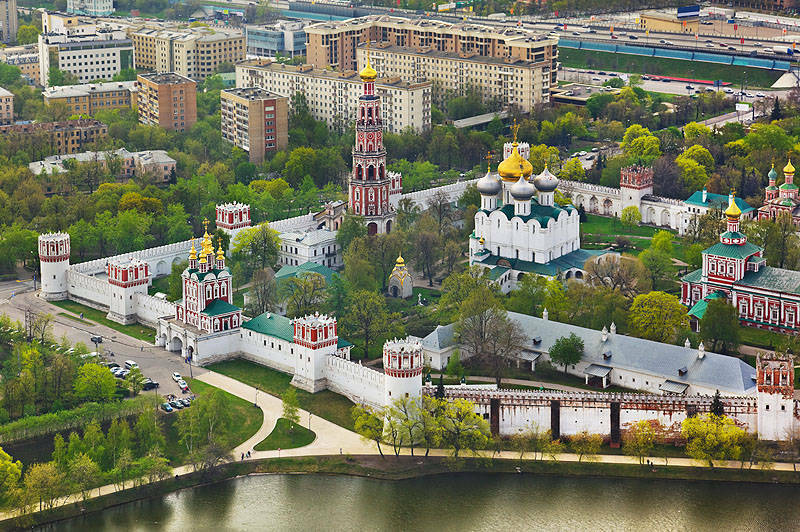 The Novodevichy ConventRussian: Novodevichiy monastyr’ or Новодевичий монастырь in Moscow (sometimes translated as the New Maidens’ Monastery) is one of the key Orthodox complexes that played a crucial role in the history of religion and public life of Russia. At the same time, this monastery is one of the most beautiful architectural monuments in the country, a true masterpiece of the 16th–17th centuries. 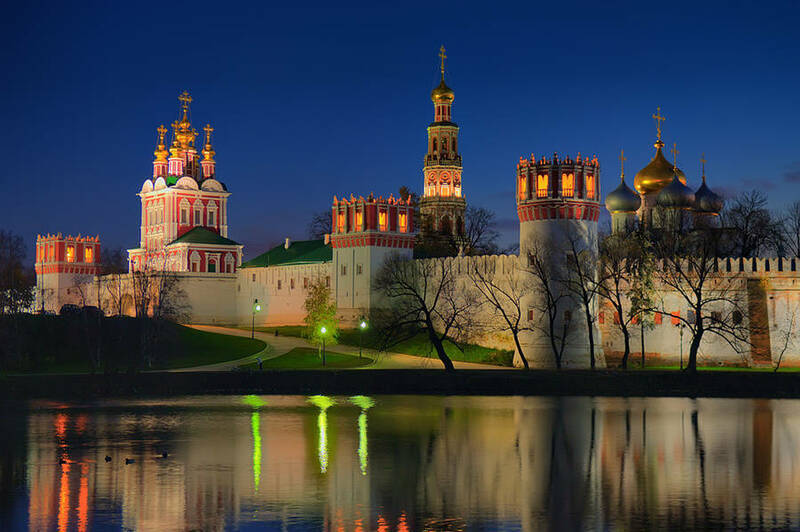 The Novodevichy Convent and cemetery were proclaimed a UNESCO World Heritage Site as they are an outstanding example of Moscow Baroque architecture. 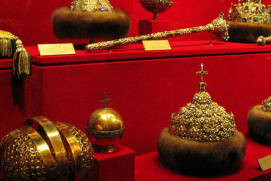 The ancient, though still-active Smolensky CathedralRussian: Smolenskiy sobor or Смоленский собор of the convent contains important Orthodox relics. 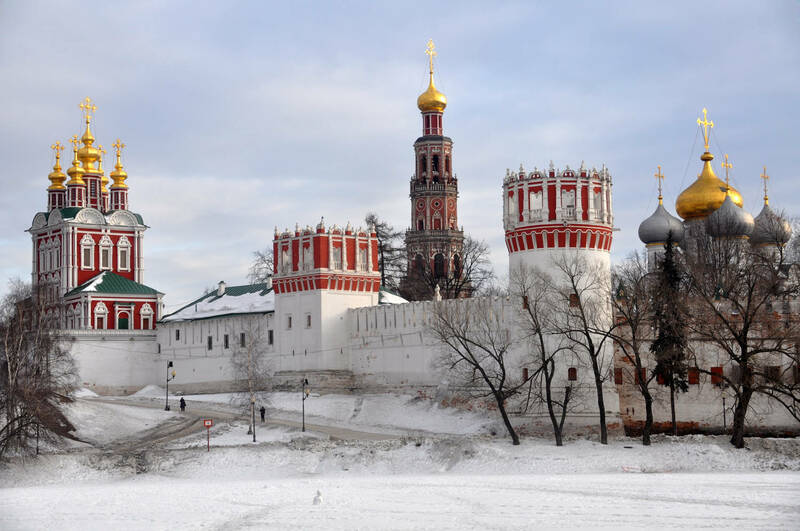 The Novodevichy Convent looks like a real fortress becuase it used to be a key fortified outpost protecting the south-western outskirts of Moscow. The remote location allowed the Lord’s servants to be of assistance to their secular ruler: they were the first to raise the alarm, and the first to accept battle. 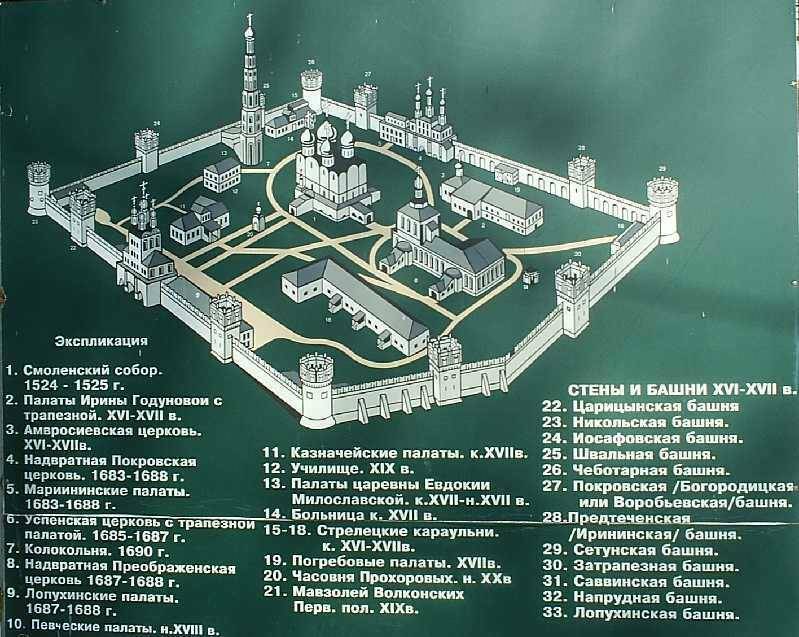 Tsar Vasily IIIthe Grand Prince of Moscow from 1505 to 1533 founded the Novodevichy Convent in 1524 with these intentions in mind. Now a beautiful monument of architecture, the convent used to be the epicenter of all kinds of historic events throughout the six centuries of its existence. 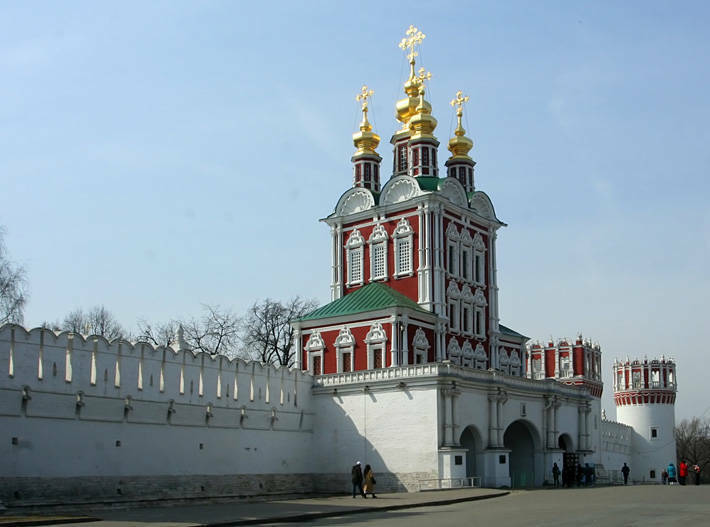 The convent bore witness to the iconic moments such as the formation of the Muscovite state, the Time of Troublesperiod of political crisis in Russia from 1598 to 1613, wars, coups, revolutions, and the campaigns designed first to destroy and later to restore the Orthodox shrines. 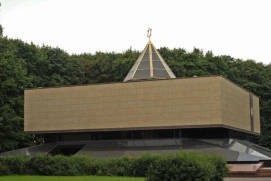 In the 19th–20th centuries, the convent necropolis became a burial place of famous personalities including artists, scientists, and Soviet party leaders. 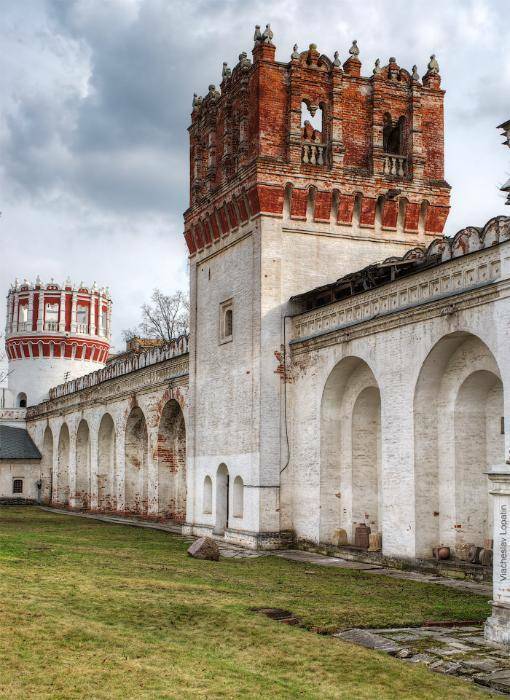 The remarkably rich history of Novodevichy Convent is full of legends. 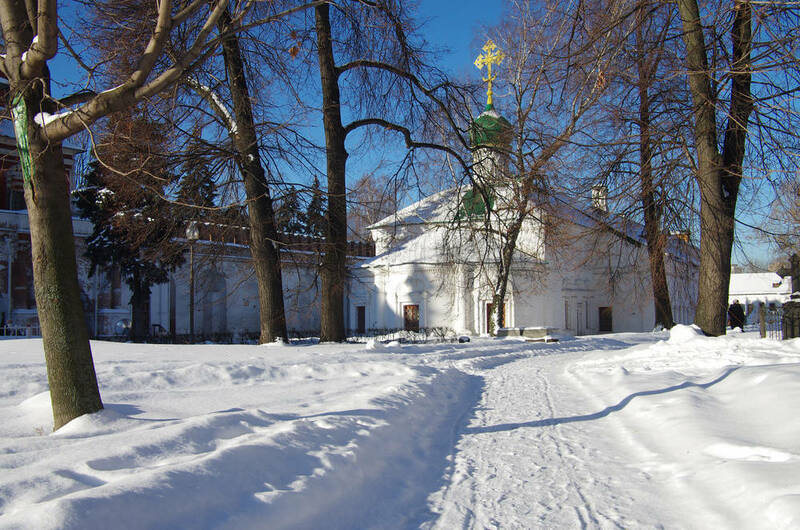 When planning your visit, keep in mind that some of the facilities were designed to be used during summer time only (such as the Smolensky Cathedral), so you will find them closed in winter. 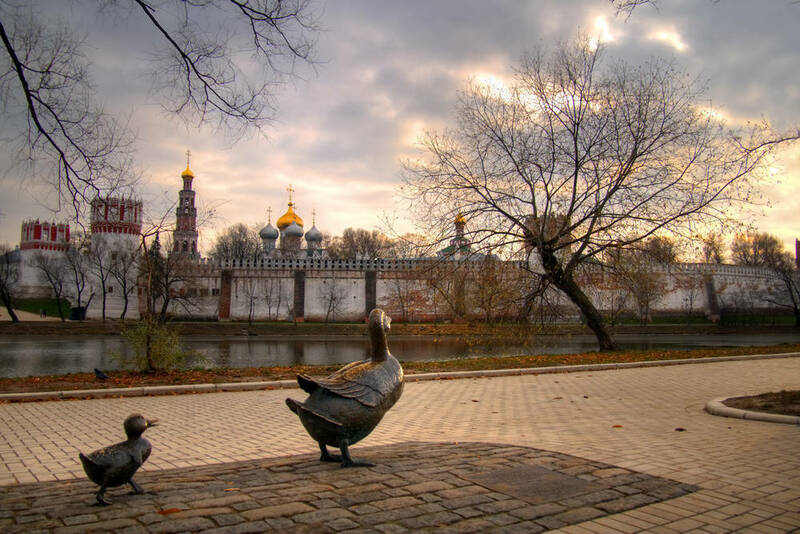 Make sure to take a walk around the Novodevichy Ponds ParkRussian: Novodevichyi prudy or Новодевичьи пруды, located immediately outside the walls of the convent. 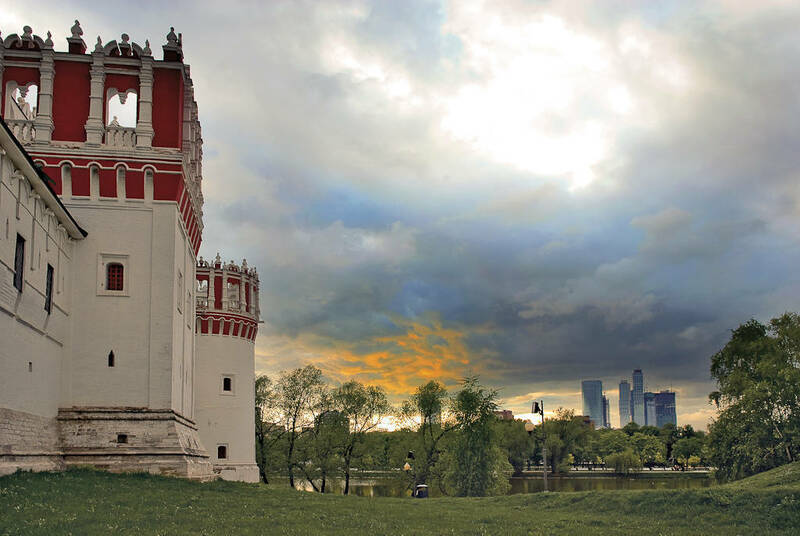 The park is very cozy and provides a wonderful panoramic view of the Novodevichy Convent. Pay attention to Nancy Schön’s “Make Way for Ducklings” sculpture depicting ducklings from Robert McCloskey’s children book. 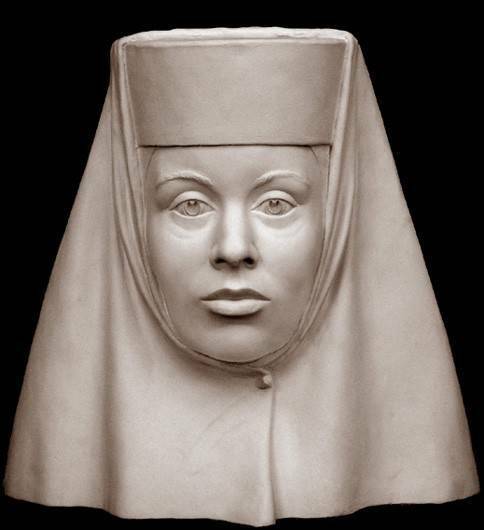 The sculpture was presented to the Soviet president’s wife Raisa Gorbacheva in 1991 by Barbara Bush, the spouse of the US president. Let us take a closer look at the origin of the name of the convent. 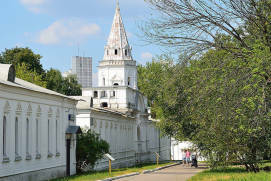 The first convent in Moscow was ZachatyevskyRussian: Zachatyevskiy monastyr’ or Зачатьевский монастырь founded near OstozhenkaRussian: Остоженка in the 14th century. 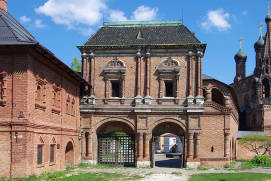 That convent is considered to be StarodevichyRussian: Starodevichiy monastyr’ or Стародевичий монастырь, or an Old Maidens’ Convent. However, there is another interesting version of the origin of the convent’s name. 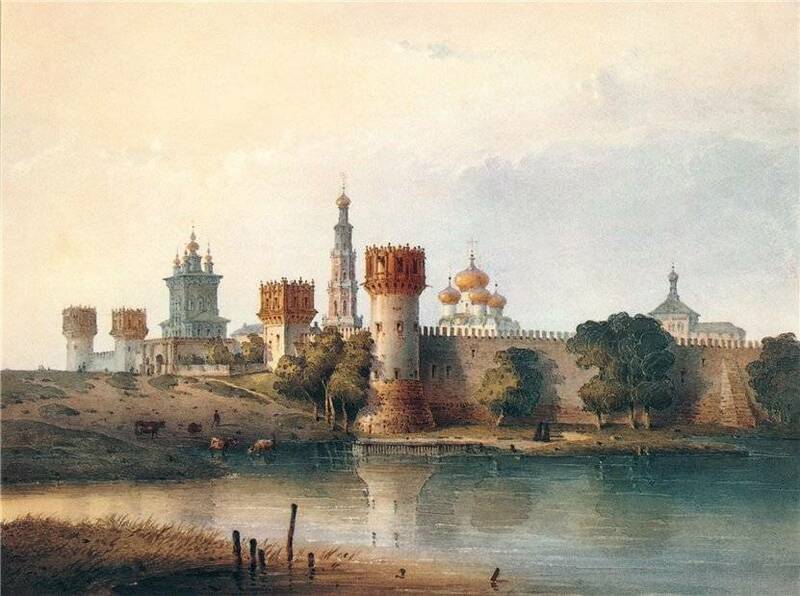 The place where the Novodevichy Convent is located used to have two names: the Samsonov MeadowRussian: Samsonov lug or Самсонов луг and Devichye (Maidens’) FieldRussian: Devichye pole or Девичье поле. 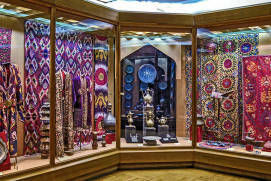 Legend holds that during the Golden Hordein Rus', the rule of the MongolTatar feudal lords over Russian lands from the 13th to the 15th century’s rule, or Tatar ‘yoke’, Tatar baskaks (officials) used to bring girls there from all over Moscow. The girls were later sent to the Golden Horde as tribute and became servants or concubines. The story of the Novodevichy Convent begins in the 16th century. 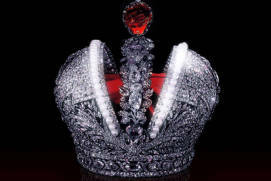 During the reign of Tsar Vasily III, the land of Smolensk a city located on the Dnieper River, 360 kilometers west-southwest of Moscowbecame part of the Russian state again. This important event was the final step in ‘the Gathering of the Russian Lands’, marking the formation of the unified and independent Muscovite State. 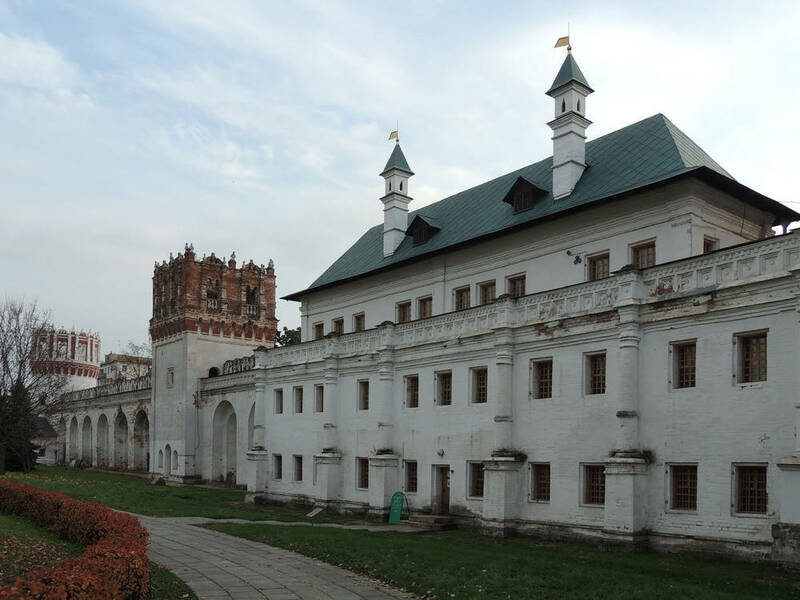 Legend has it that Vasily III vowed to build a convent with a church in honour of the Mother of God if he reconquered Smolensk. 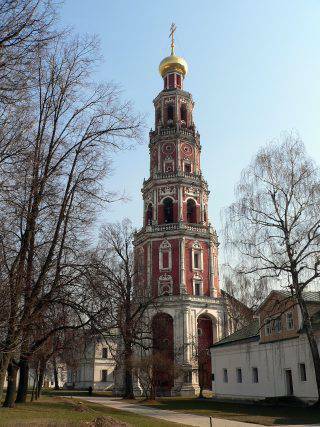 The Smolensky Cathedral was the first to be built within the Novodevichy Convent. 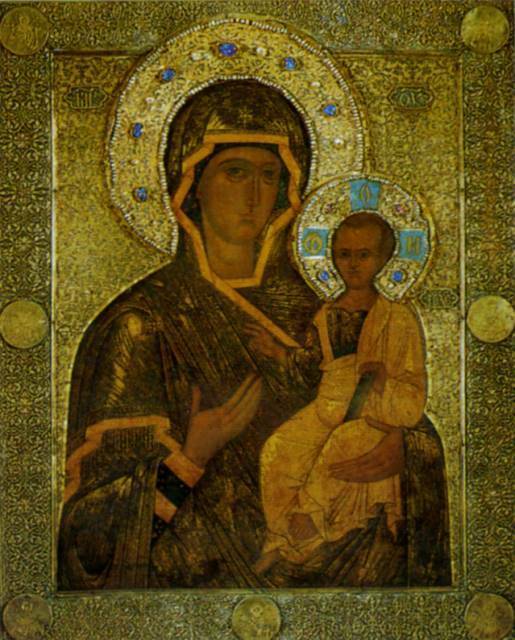 It is home to the ancient icon of Smolensk Virgin HodegetriaRussian: Смоленская Божья матерь Одигитрия, in the honour of which the church was consecrated. 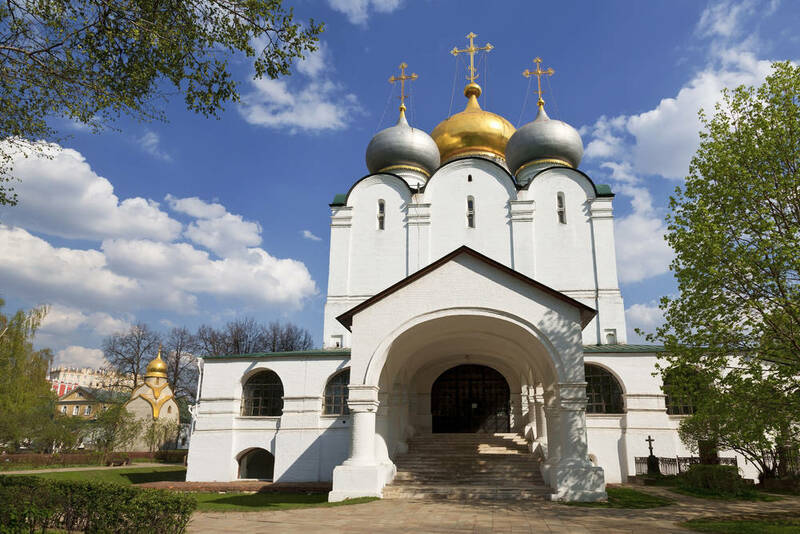 As legend has it, the church was built where Muscovites had bid farewell to the Smolensk icon of the Mother of God, which was returned to Smolensk in 1456 by the order of Moscow Grand Prince Vasily II the BlindGrand Prince of Moscow from 1425 to 1462. 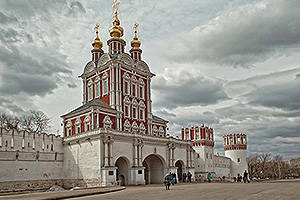 The cathedral differs in style from the rest of the convent as it was built to resemble the Cathedral of the DormitionRussian: Uspensky sobor or Успенский собор in the Kremlin. 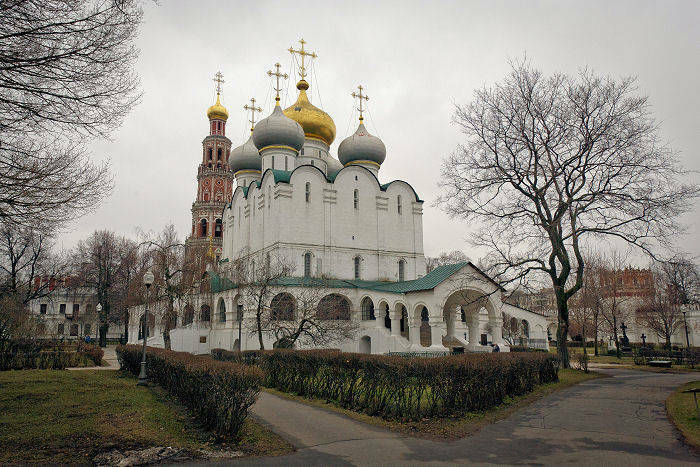 It is now an example of the typical Orthodox church architecture of the late medieval period. 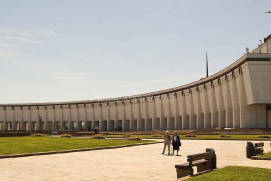 The design is attributed to Italian architect Aloisio the New, but another school of thought credits Nestor the Chroniclerthe reputed author of the Primary Chronicle, the earliest East Slavic chronicle. 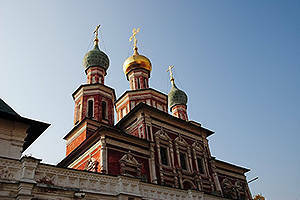 It is a traditional five-domed cathedral with clear-cut and simple forms. 16th-century mosaic panels are preserved in the interior of the cathedral. However, the construction of the monastery itself began a bit later. 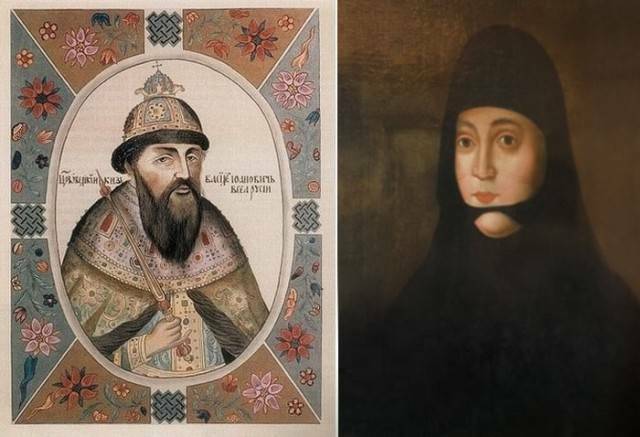 Many historians make a link between the start of construction and Tsar Vasily III’s divorce with his first wife Solomonia Saburova, who failed to beget an heir after 20 years of marriage. The Tsar even forbade his nephews to marry, trying to avoid any other claimants to the throne. The fear of having no heir led him to the divorce, an unprecedented step at that time. 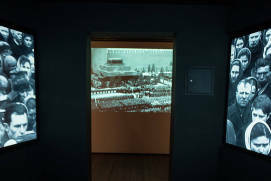 This event, followed by Solomonia’s forced exile to the convent, caused public outcry in the patriarchal society, yet the protests were brutally suppressed by the Tsar. The priests who spoke out against it were exiled and the Metropolitan of Moscow was defrocked. 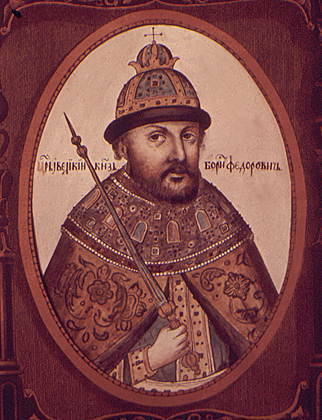 It is believed that Tsar Vasily III commissioned the Novodevichy Convent specifically to confine Solomonia there. Later on, other rulers used the convent to immure their wives, sisters and other female relatives who fell out of their favour. Thus, the convent not only protected its dwellers but also served as a luxury prison for many of them. 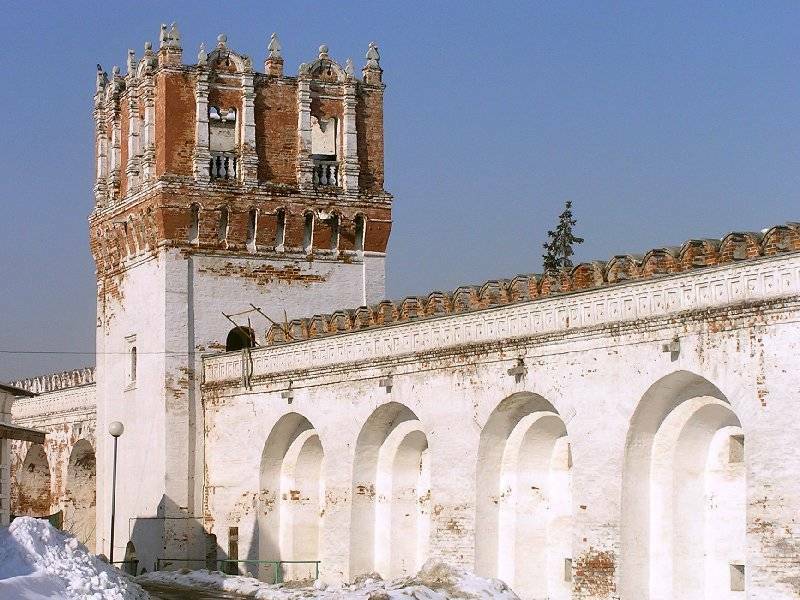 Solomonia didn’t stay in the Novodevichy Convent for long: she ended her life in another convent in Suzdalone of the oldest Russian towns located on the Kamenka River. 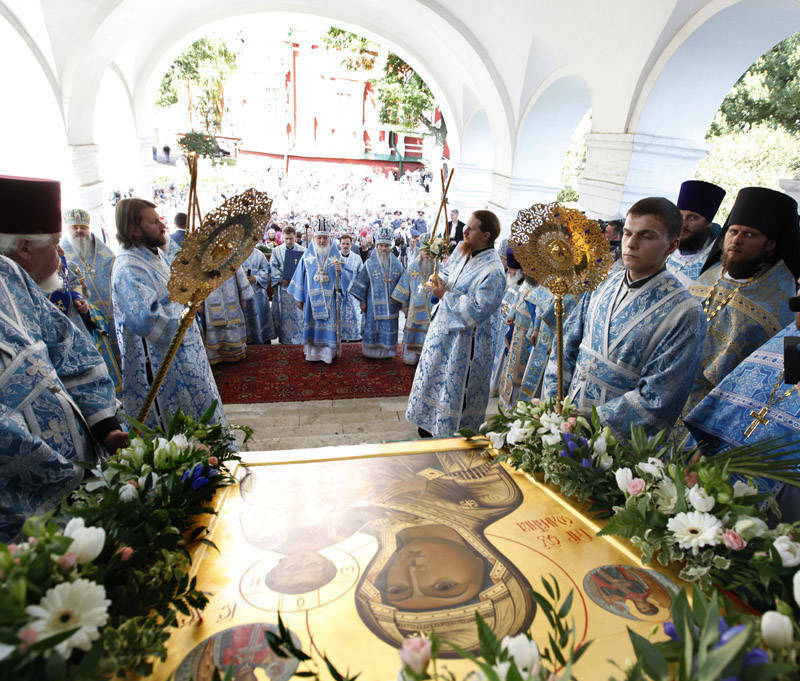 The Russian Orthodox Church canonised her Saint Sophia of SuzdalRussian: София Суздальская. 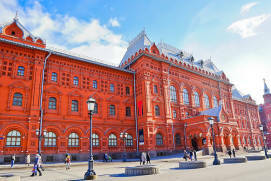 If the Russian history is a subject of your interest and you want to know, for example, what is the oldest church in Moscow, what are the famous monasteries around Moscow, which style of Moscow architecture you can see only in this town, you can read on our website pages about the Kremlin and “History and Architecture”. 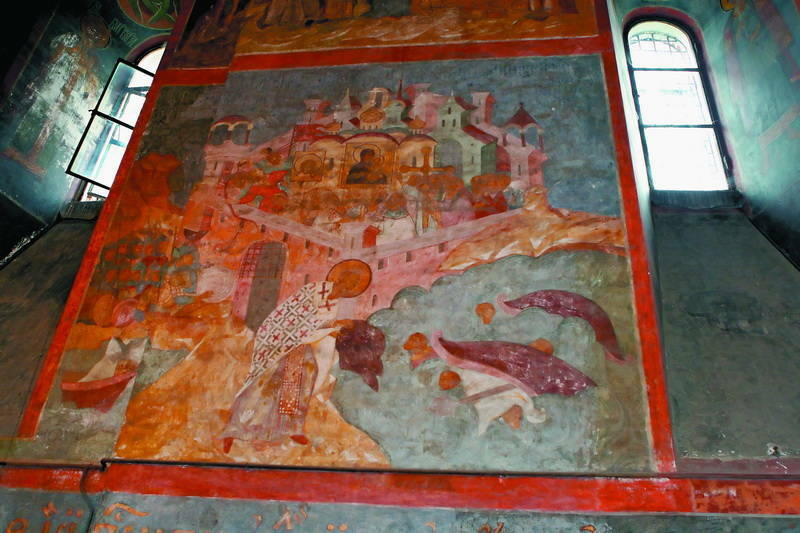 In 1598, after the death of Feodor I Ioannovich, the last Rurikidfounded in 862 by Rurik, a Varangian prince Tsar of Russia, his widow Irina Godunova, then the heir to the throne, moved to the convent. 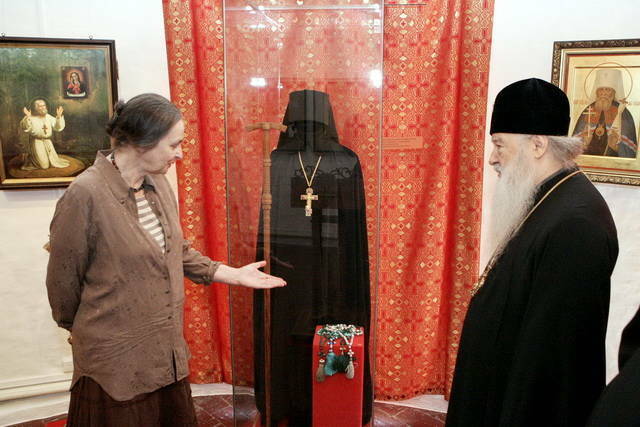 Taking the monastic vows was tantamount to abdicating on her part, yet she de facto ruled the country from the Novodevichy Convent for a few months. The convent turned into the residence of the head of state for a while. 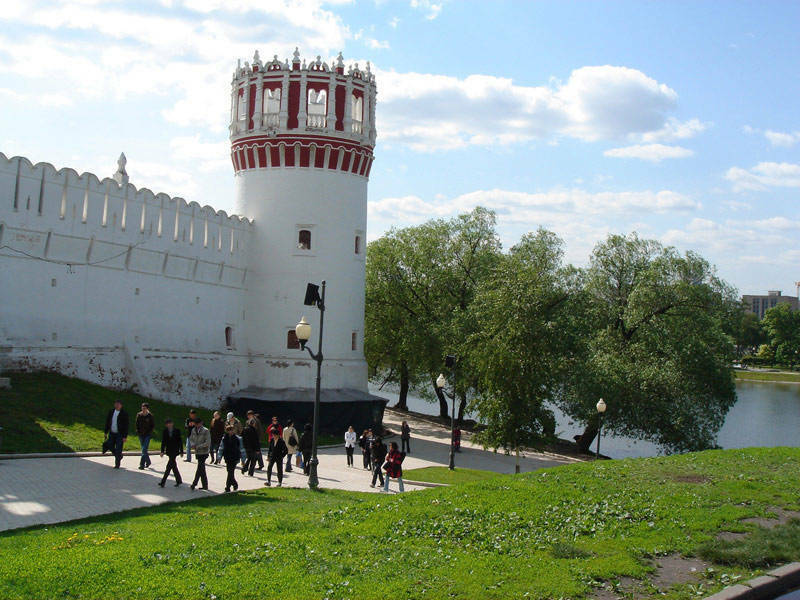 Although the Novodevichy Convent is a nunnery, its thick walls also provided a refuge for Boris Godunov, Irina’s brother and the future Tsar. In the Smolensky Cathedral, Boris Godunov accepted the throne in 1598. Later, in 1606, during the Time of Troubles, Prince Vasily Shuiskybecame tsar (1606–1610) during Russia's Time of Troubles’s soldiers stayed in the convent before the final battle with the rebellious peasant army of Ivan Bolotnikovthe leader of a popular uprising in Russia in 1606–1607 known as the Bolotnikov Rebellion. 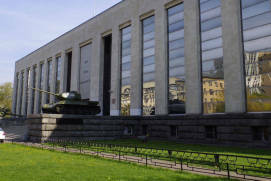 It was also where the Second MilitiaPeople’s Volunteer Army of Kuzma Minin and Dmitry PozharskyDmitry Pozharsky belonged to the aristocracy and Kuzma Minin reportedly was the son of a salt producer defeated the Polish and Swedish invaders in the decisive battle of 1612 to take the Kremlin. 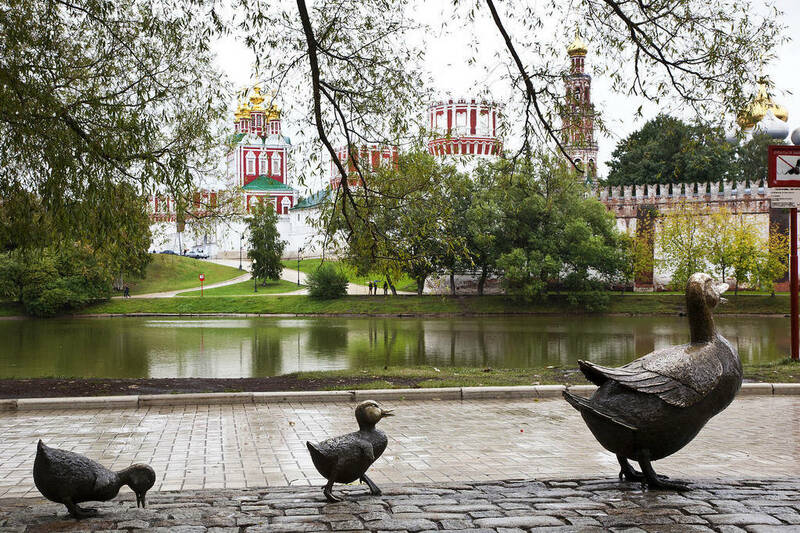 The Novodevichy Monastery has always been in the thick of the country’s political life. 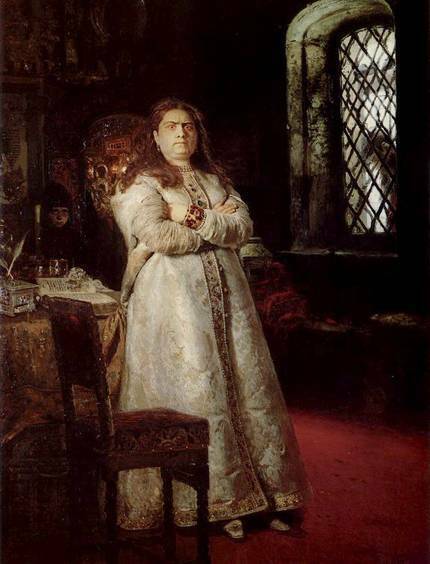 However, probably the most dramatic events in its history took place at the end of the 17th century, when there was a struggle for power raging between Tsarevna Sophia Alekseyevnaruled as regent of Russia from 1682 to 1689 and her brother, future Emperor Peter the Greatruled from 1682 to 1725. 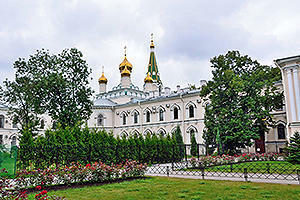 At that time, the convent was the Tsarevna’s residence. It was a bitter struggle; having lost it, Sophia was forced to take the veil under the name of Susanna. 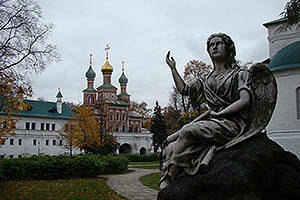 She remained imprisoned in the Novodevichy Convent from 1689 until her death in 1704. However, even being incarcerated, she seemed a danger to her brother. 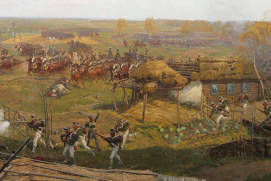 After the StreltsyRussian: стрельцы; the units of Russian guardsmen from the 16th to the early 18th centuries, armed with firearms Uprising, he ordered the hanging of her supporters on the convent wall near the Naprudnaya (‘Pond’) TowerRussian: Naprudnaya bashnya or Напрудная башня, directly in front of his sister’s cell windows, as a warning to her. 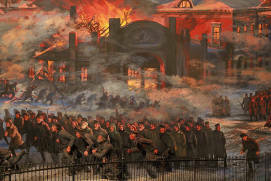 This episode is captured in a famous painting by Ilya Repinthe most renowned Russian artist of the 19th century. 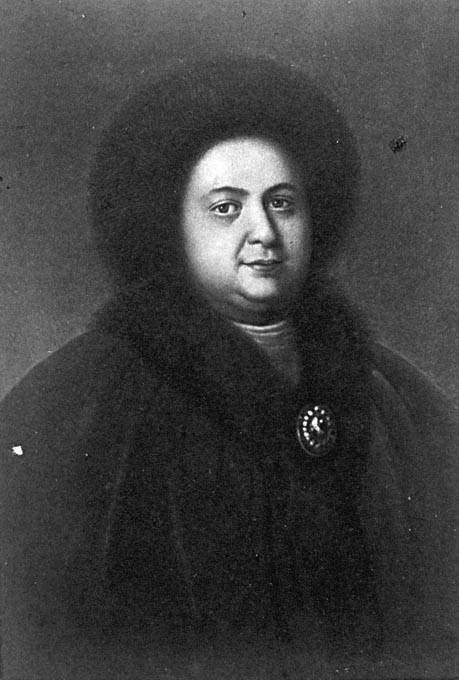 Later, Tsar Peter IIreigned as Emperor of Russia from 1727 until 1730 gave his permission to Eudoxia Lopukhina, the first wife of Peter the Great, to move to the Novodevichy Convent. 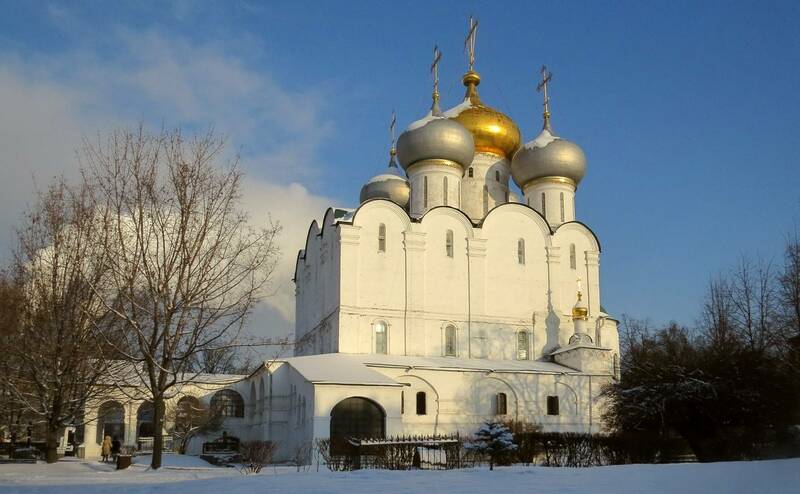 She had been previously forced to take the veil by her husband and kept for many years in the Suzdal ConventRussian: Suzdalskiy monastyir or Суздальский монастырь, another traditional place for exile of tsarinas. Now, a romantic page. 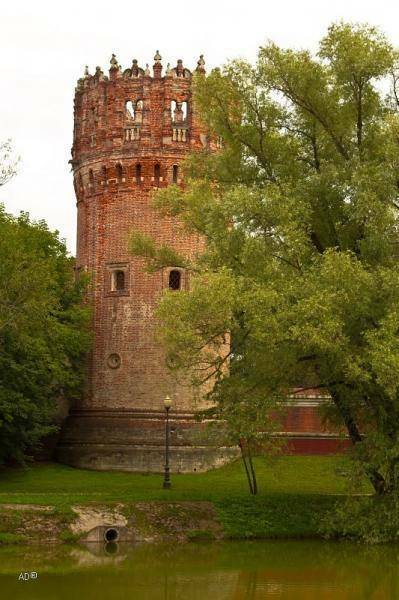 According to a local legend, the Naprudnaya Tower is a wish tower. Don’t hesitate to touch its walls to make a wish, ask or hope for something—and all you’ll have to do is wait for your dreams to come true! 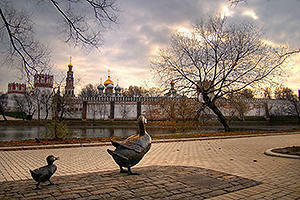 Let’s set aside the wish-making romantics for now and get back to the history of the Novodevichy Convent. 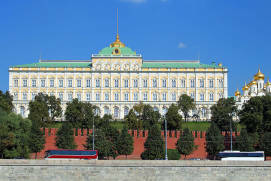 When Napoleon’s army occupied Moscow in 1812, the convent served as food storage for the French. 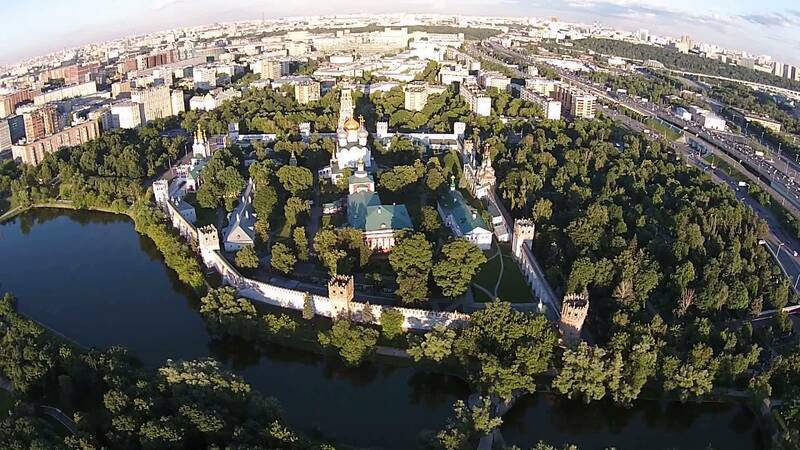 There are many legends about Napoleon’s stay in Moscow, including a story related to the Novodevichy Convent. 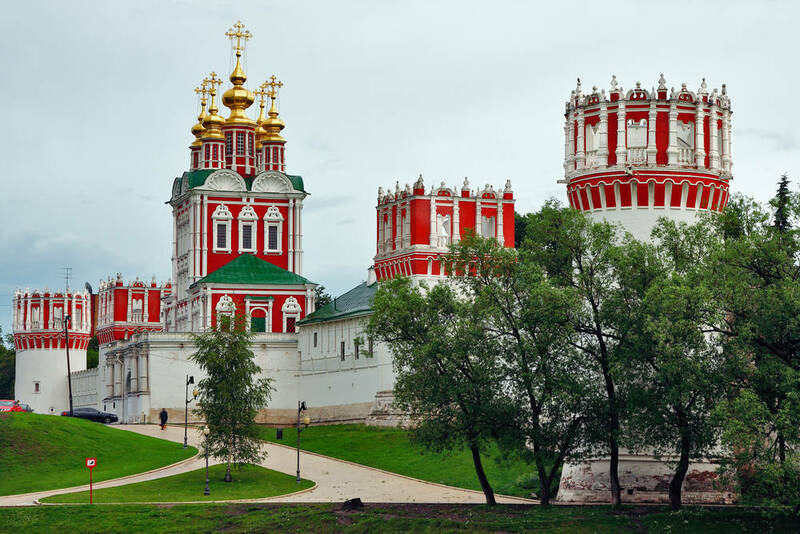 Napoleon is said to have ordered to set the Novodevichy Convent on fire and refused to leave Moscow without seeing with his own eyes that the convent is destroyed. He spent a long time on the Sparrow HillsRussian: Vorobyovy gory or Воробьёвы горы on the other bank of the Moscow River with his camp, expecting to see the fire. 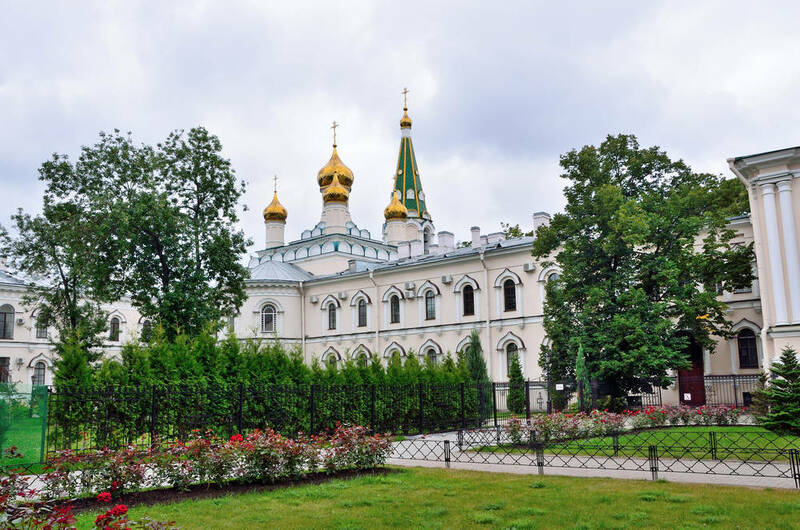 However, the nuns managed to defuse the areas that had begun to smolder, and one of the Muscovites set his own house located near the Novodevichy Convent on fire to persuade Napoleon that the cloister would eventually burn down. 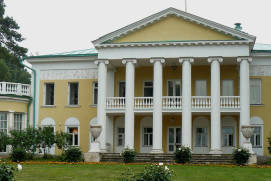 The convent’s appearance mostly formed in the 17th century, during the reign of Tsar Boris Godunov and later Tsarevna Sophia. 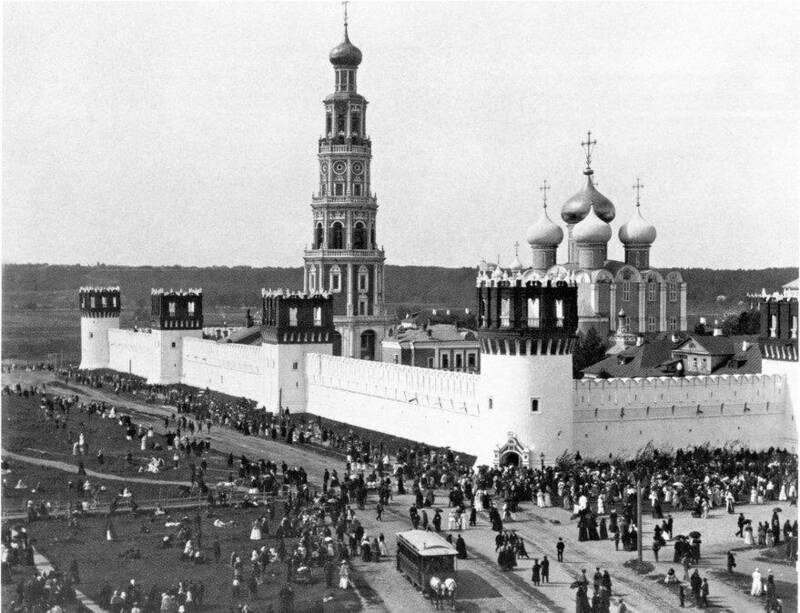 The walls and towers were erected in Godunov’s time, while Sophia expanded and fortified them. During her regency (1682–1689), Sophia actually moved to the Novodevichy Convent and put a lot of her energy and effort to decorate it. 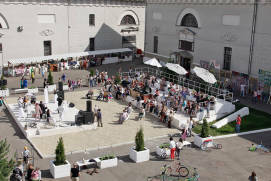 It was at that period that the unique ensemble of the whole complex finally took shape. On each of the four sides of the Smolensky Cathedral, there are churches built in the so-called Naryshkin Baroquea fusion of traditional Russian architecture with baroque elements imported from Central Europe style in the 1680s: the RefectoryRussian: Trapeznaya or Трапезная with the Church of the Dormition, a bell tower, the Transfiguration Gate ChurchRussian: Preobrazhenskaya nadvratnaya tserkov or Преображенская надвратная церковь, and the Intercession Gate ChurchRussian: Pokrovskaya nadvratnaya tserkov or Покровская надвратная церковь. If you look at all this splendour from above, you will see a perfect cross with the Cathedral of the Smolensk Icon of the Mother of GodRussian: ikona Smolenskoy Bozhey materi or икона Смоленской Божьей матери in the centre. white stone and red brick. 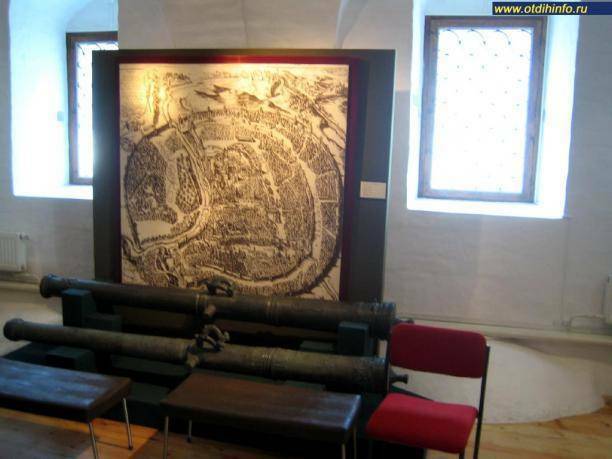 This makes even its huge walls (up to 3 metres thick and 11 metres high) and impregnable towers look more like elegant toys than fortification elements. White-stone openwork details stand out against the smooth red brick walls. 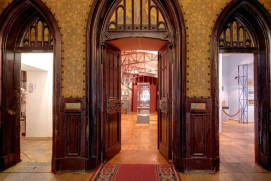 Although this architectural style is referred to as Baroque, the term is not very accurate. Indeed, the architecture of that epoch is very beautiful and sumptuous, with a lot of complex embellishments and ‘stone lacework’. 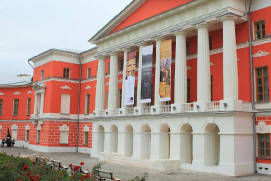 Yet, the buildings in the Naryshkin Baroque style always retain clearly divided sections and rigid logical patterns. This is a geometrically perfect mesh that serves the base for vivid openwork aprons, ‘rooster tail’ balustrades, galleries, and crown-shaped finials. 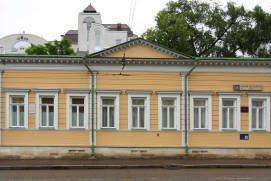 The so-called Irina’s ChambersRussian: Irininskie palaty or Ирининские палаты (named after Irina Godunova) form the second most ancient building in the cloister after the Smolensky Cathedral, but they have not retained their original appearance. 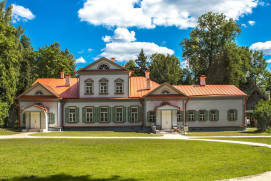 Maria’s CellsRussian: Mariinskie kelyi or Мариинские кельи built for another of Peter the Great’s sisters pose more interest from an architectural perspective. 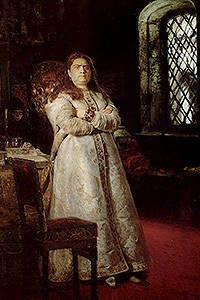 Maria Alekseyevna had expressed sympathy for Eudoxia Lopukhina and Tsarevich Alexeithe son of Tsar Peter I and Eudoxia Lopukhina and was punished by being exiled to the convent. 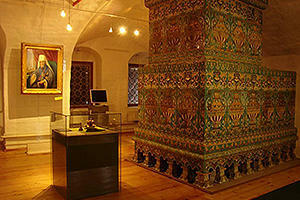 The Refectory with the Church of the Dormition is a unique example of a pillarless chamber (with no support pillars inside), adjoined from the east by a church featuring an iconostasis with icons painted in the fryazh (i.e. 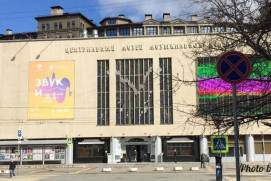 Western) styletechniques of iconography and murals, distinguished by external authenticity in the transfer of the material world by Karp Zolotaryov, a famous icon painter of the 17th century. 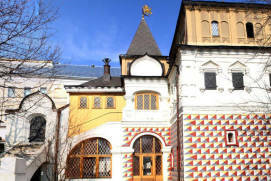 he latter has fewer decorations, but it is also very unique: the domes are set around the same axis, which was rather typical of Ukrainian architecture of the 17th century. 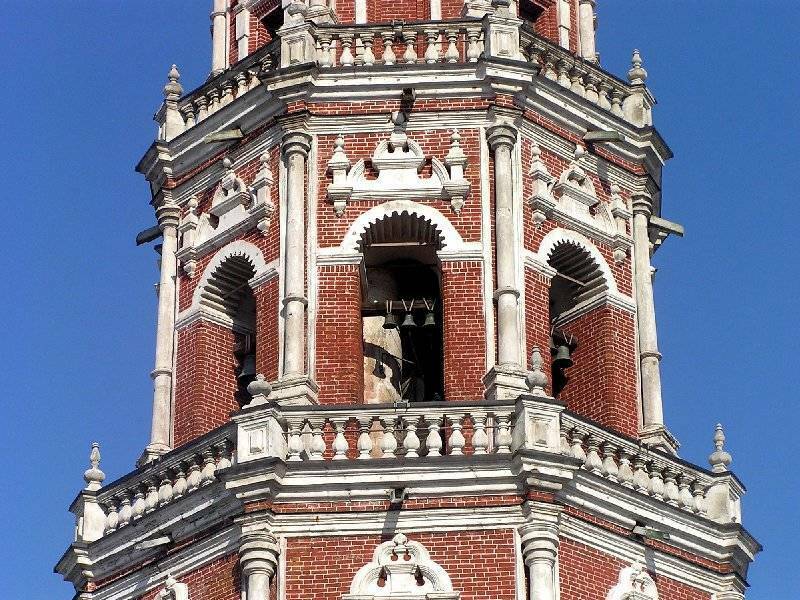 The Bell Tower is the most distinctive building of the convent. It has six tiers of octagonal structures mounted one on top of another. Each of the tiers is unique in its decoration, and there is a small church inside the basement. 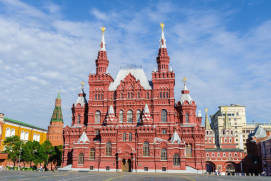 The Bell Tower is the main vertical axis of the ensemble, being the second tallest building of its time after the Ivan the Great Bell TowerRussian: kolokol'nya Ivana Velikogo or колокольня Ивана Великого in the Kremlin. 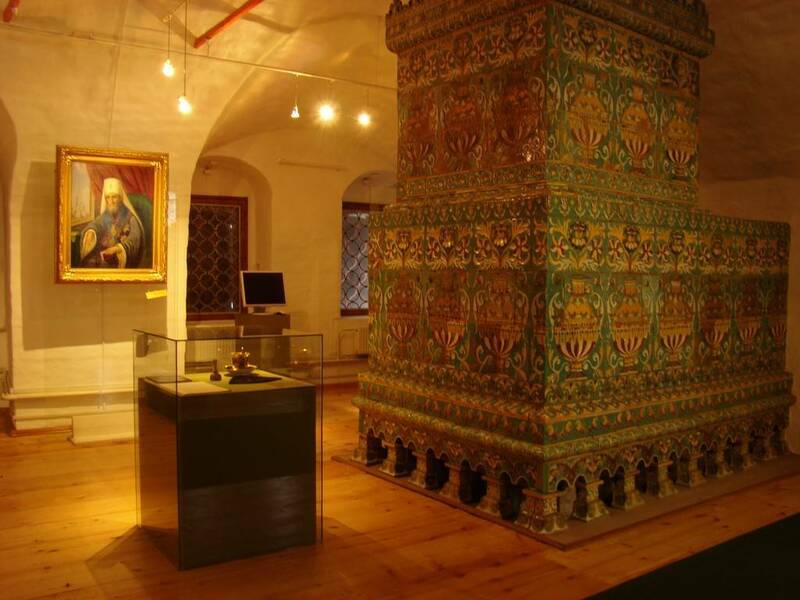 It is believed that Tsarevna Sophia wanted to build another tier but didn’t have enough time to complete it. As a result, the bell tower is 72 metres tall. ld one, the new one, and the newest one. 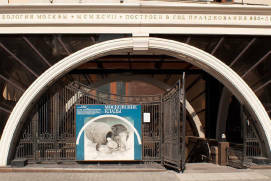 This is one of Moscow’s best-known burial places. 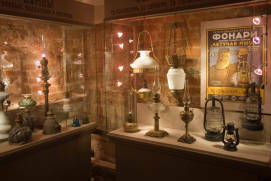 It is associated with the names of such famous people like Nikolai Gogol, Mikhail Bulgakov, Sergey Prokofiev, Vladimir Mayakovsky, Anton Chekhov, Nikita Khrushchev, and dozens of other remarkable personalities. The Novodevichy Cemetery also became the final resting place to executioners of the Soviet period (Vyacheslav Molotov, Lazar Kaganovich) and their victims, renowned literary figures, scientists and monks: Lev Landau, Nikolay Zabolotsky, Nikolai Vavilov, and others. 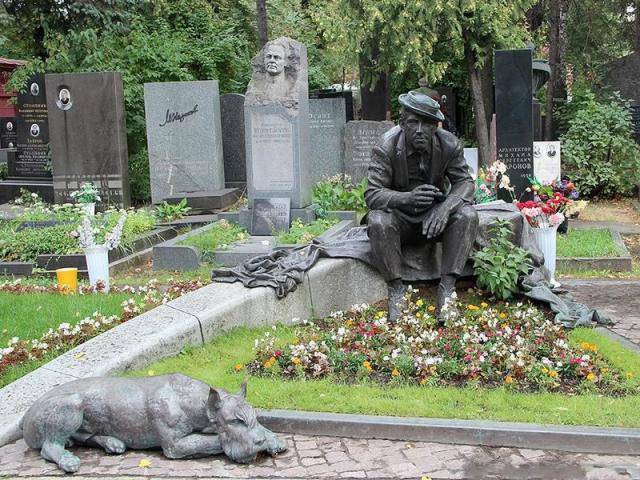 The tombstones themselves are also of special interest: many of them were created by the best-known Russian artists and sculptors (Mikhail Vrubel, Sergey Konenkov, Vera Mukhina, Ernst Neizvestny, etc.). The convent was closed down in the 1920s. 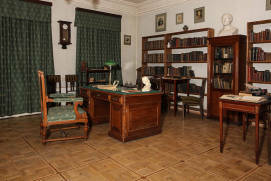 Its territory was used to set up the Museum of Female EmancipationRussian: Muzey raskreposchennoy zhenschiny or Музей раскрепощенной женщины, which was later turned into the Art Museum of History and Everyday LifeRussian: Istoriko-byitovoy hudozhestvennyi muzey or Историко-бытовой художественный музей, and then into the Novodevichy Convent MuseumRussian: muzey «Novodevichiy monastyir» or музей «Новодевичий монастырь». 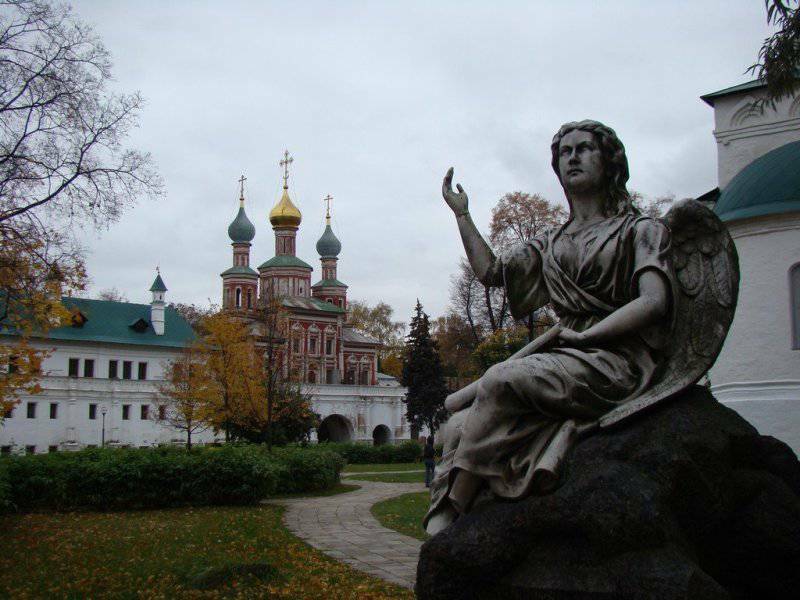 Theology courses were organised in the Novodevichy Convent in 1943, during World War II. 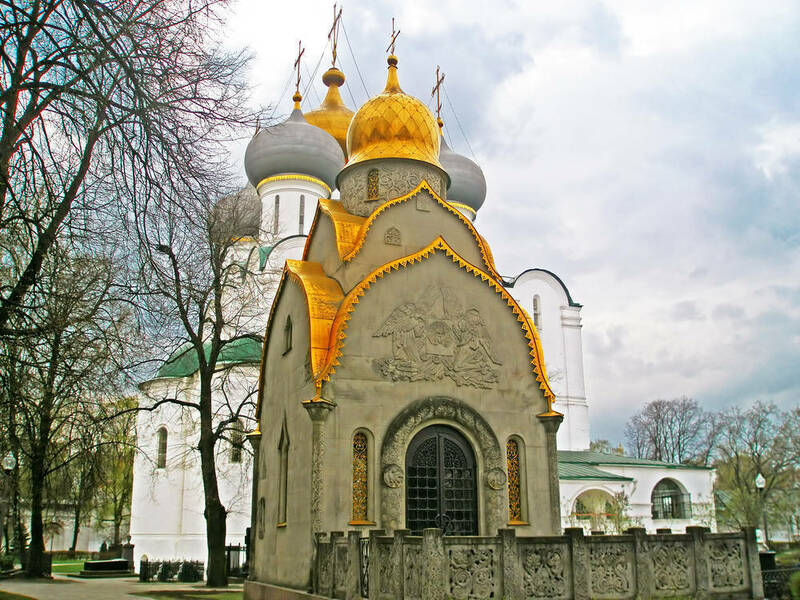 The courses gradually evolved into a seminary, which was later transferred to the Trinity Lavra of St. Sergiusthe most important Russian monastery and the spiritual centre of the Russian Orthodox Church situated in the town of Sergiyev Posad. 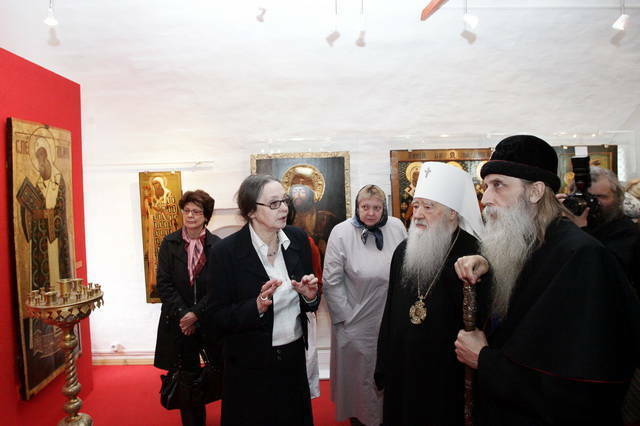 Monastic life resumed at the convent in 1994. 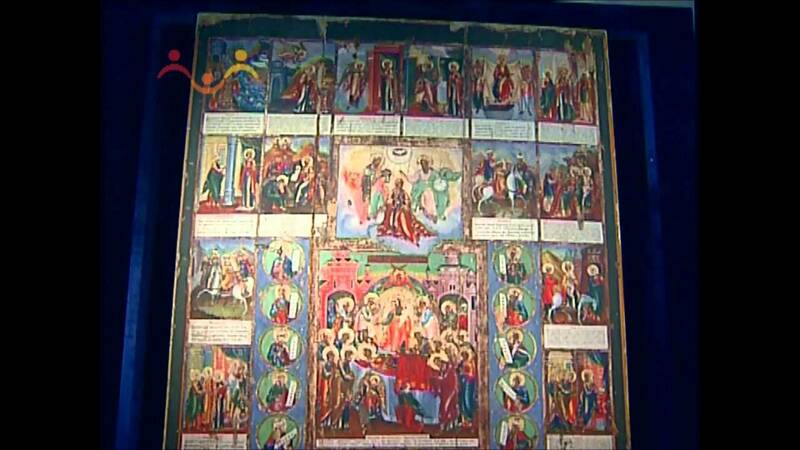 Later, the whole complex was transferred under the supervision of the Moscow Diocese of the Russian Orthodox Church. 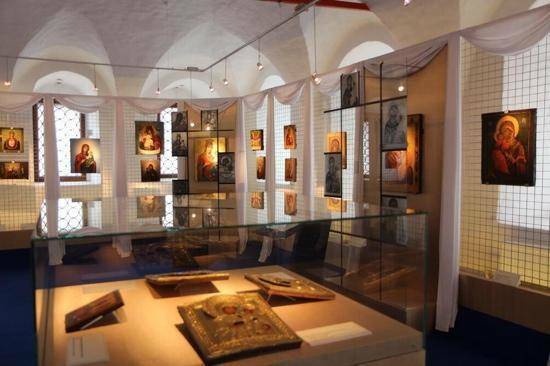 Meanwhile, the Convent is accessible to the public, offering organised tours to tourists and pilgrims, as well as hosting exhibitions. 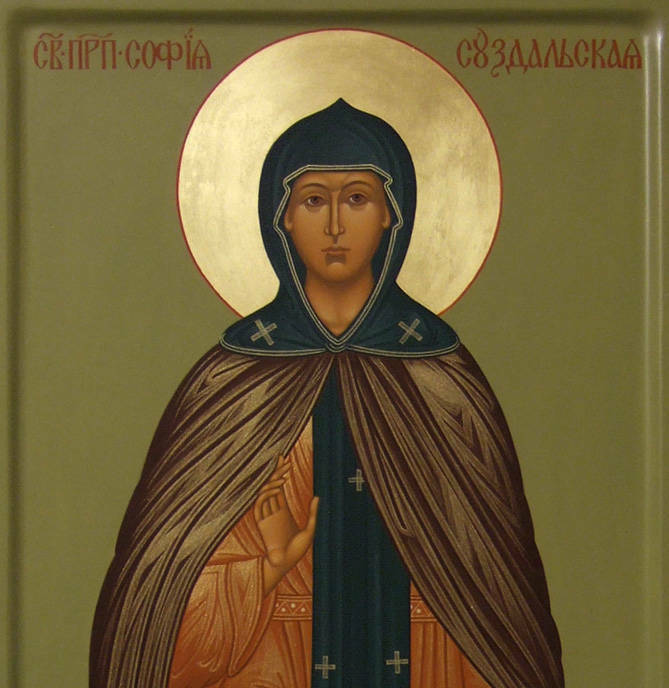 A collection of icons of the Mother of God has been displayed in the small rooms of Sophia’s ChambersRussian: Sofiny palaty or Софьины палаты over the last years. 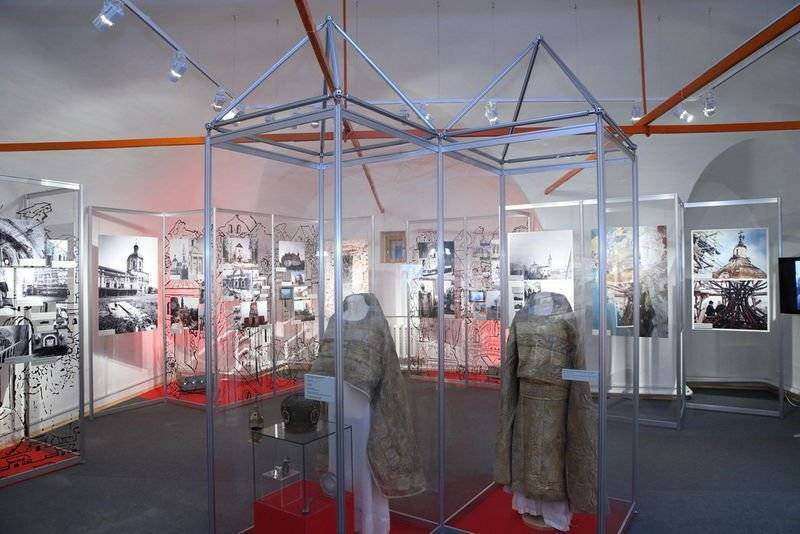 Another museum exhibition is devoted to Hegumenia Serafima (Varvara Chichagova-ChernayaSoviet chemical scientist, engineer, nun), whose name is associated with the revival of the Novodevichy Convent. 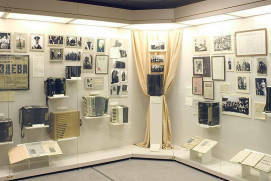 Exhibits include her documents, diaries, scientific works, and personal religious habit. The podklet (the bottom part of the chambers’ basement) was used to store weapons in the 17th century. 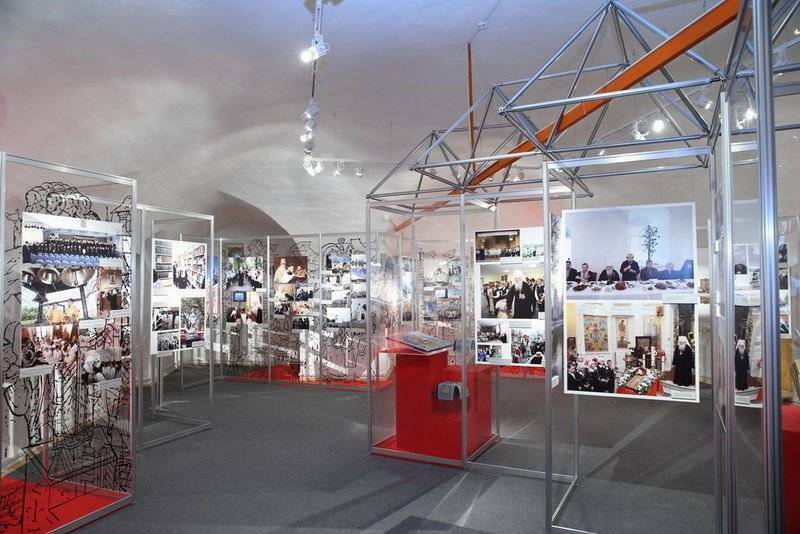 The permanent exhibition in this spacious hall was opened in 2012 and covers the history of the convent during the War of 1812the war between the Russian Empire and Napoleonic France on the territory of Russia in 1812. There are a couple of soldier outfits, some documents, icons, white-stone parts of cathedrals and chambers that have been left as a reminder of that ruinous war. There are also a lot of copies of engravings and drawings depicting the variety of military uniforms of different kinds of troops. 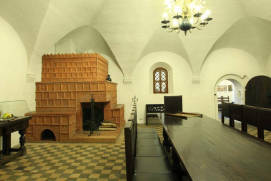 At the very end of this hall, you will see a set of stairs leading down to the foot of the Naprudnaya Tower. There is still the water well designed to supply the convent with water during a siege. It is estimated to be 500 years old! 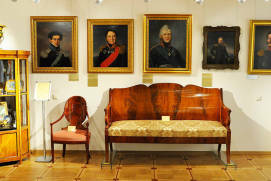 Some halls of the private chambers of Tsarina Irina Godunova (Irina’s Chambers) also hold some expositions. It's necessary to comply with the requirements for appearance and clothing. There is an audio guide in Russian. I like this place very much. 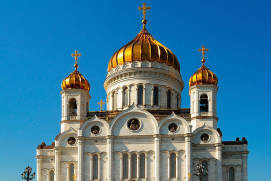 There is a beautiful Russian white-red-gold architecture: Kremlin's high walls, golden domes of churches and bell-towers, wonderful park. I won't describe temples. This miracle need to be seen. I really like the park around the monastery. It is landscaped. 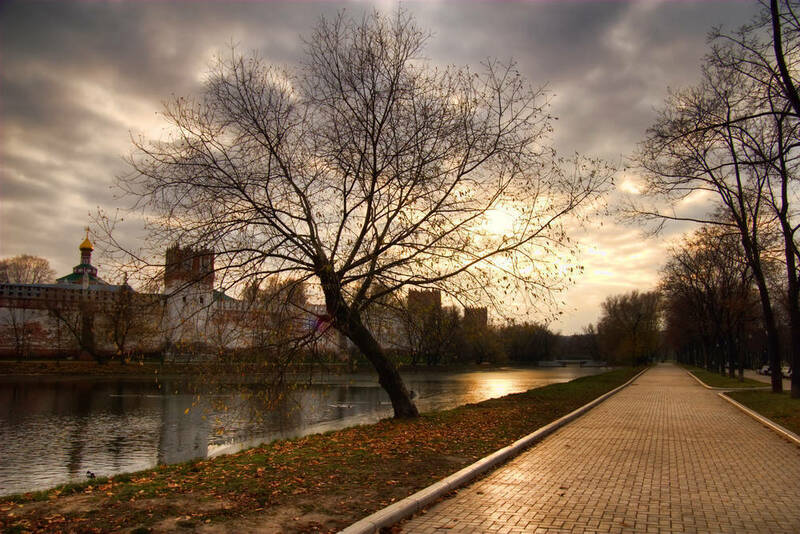 There are nice paths, benches, several playgrounds and it's clean all around. 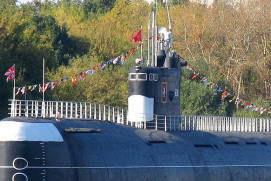 It's one of the main sights of Moscow. The monastery was built as a defence construction according to the rules of that time. It has powerful walls and towers. 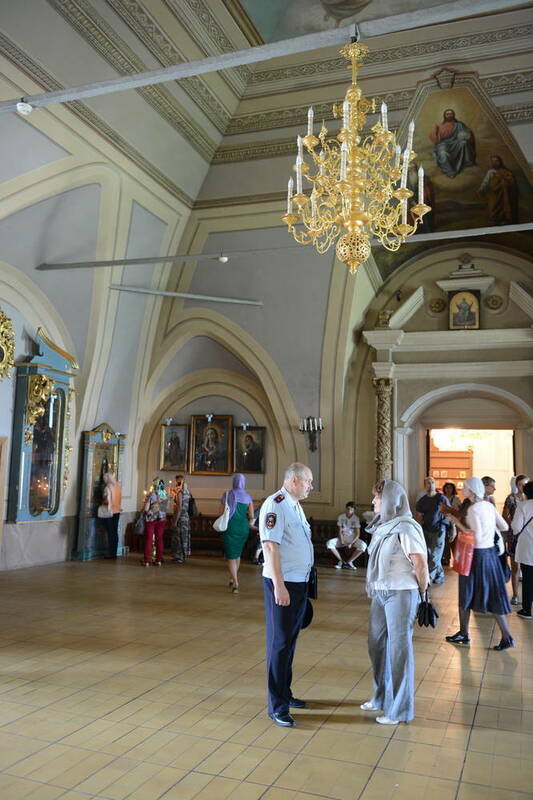 The area is well-kept here, it's nice to walk there, to take a look at the places where disgraced tsarevnas were kept prisoners and at the building of worship. 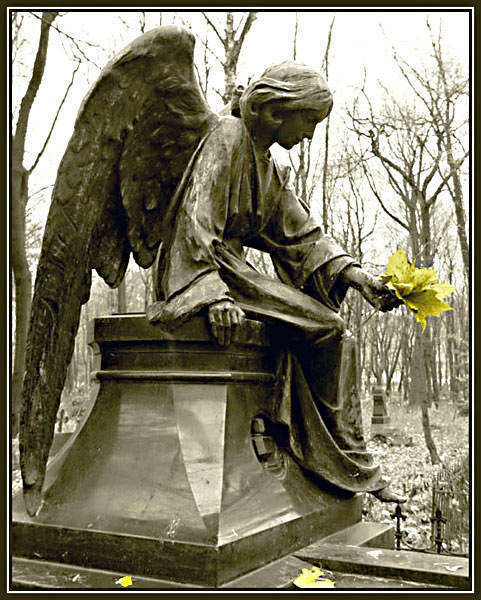 Particular attention attracts to the burial places of the famous people of the art world and military leaders. I regularly go to the Novodevichy Convent. I go to the service. The place is beautiful. Temples are worth seeing. 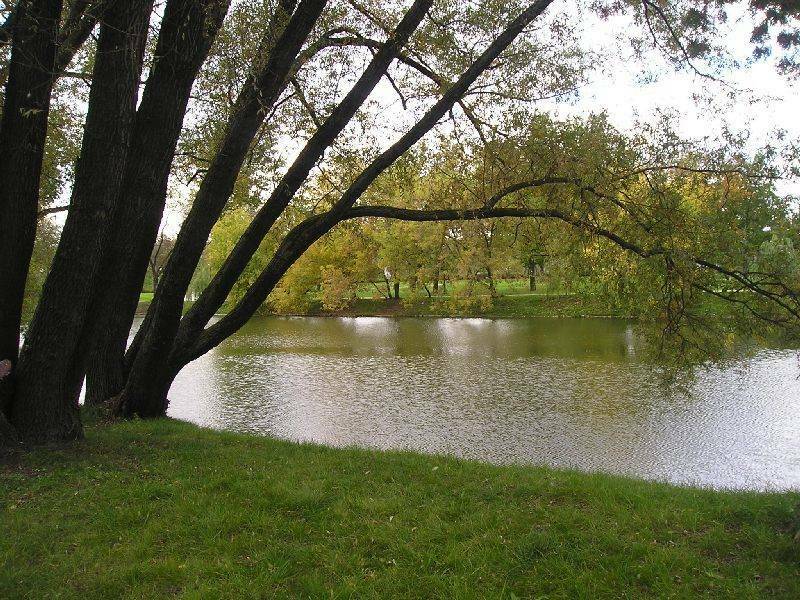 There is a pond nearby, where you can take a walk, have a picnic. It's a place where you can practice foreign languages. There are crowds of tourists. On Sunday morning, you can see a large crowd of people in the service. 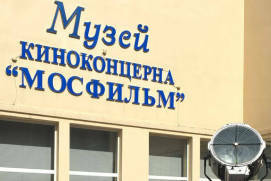 No wonder, the largest Orthodox brotherhood in Russia gathers there, it's the Preobrazhensky Brotherhood. It's an interesting place with special vibes, beautiful buildings, history in every corner. But it's very crowded on weekends, the silence should be looked for on weekdays in the morning. Only then you begin feeling holiness of this place, and the echo of the events that once occurred here. From everyday routine - it's hard to find toilets and to buy food.